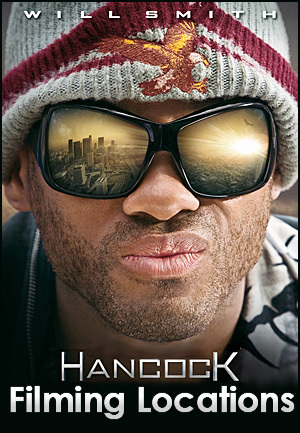 where 2008's "Hancock" was filmed. at the scene of the crime and deftly dispatches the bad guys. between the Paul Hastings tower (on north) and the CNB tower (on south). Hancock & Ray celebrate over dinner at a fancy restaurant. That restaurant was real. It was Cafe Pinot, which can be found at 700 W. 5th St, in downtown L.A.
That's right next to the US Bank Tower and the Los Angeles Central Library. We see Hancock's trailer (again) when Ray's wife shows up there to warn him to stay away. between Malibu & Point Magu, but it's hard to pinpoint the exact spot. (Sycamore Cove), in Point Magu State Park (see the map below). But I could be wrong. In the photo above, we're looking east up Hollywood Blvd, towards Highland Ave. In the photo below, we're looking west/southwest down Hollywood Blvd, towards Orange Ave.
another corporate pitch, exposing the secret that Ray's wife has super powers. That building is part of the "Century Park" complex, at 2000 Avenue of the Stars, in Century City. The photos on this page are stills from the DVD of "Hancock"